*Disclaimer: This Unit Focus was written and published just prior to the September 2018 FAQ. While being able to Cult Ambush Turn 1 wasn’t the sole boon of Genestealer Cult, it does hurt this and other units. We await the changes GW decides to make with the impending Codex Release along with the rest of you. Welcome supplicants of the Four-Armed Emperor, to another edition of Warhammer Unit Focus. In this installment, we’re taking a look at the recently updated Genestealer Cult Aberrants. With their impending codex release, Genestealer cult has made its way primarily as a support army to primary Tyranid armies. GW paired the followers of the TRUE Emperor against the Space Wolves in the Tooth and Claw box set. In that, they updated the heavy hitting mutants. They also introduced a character variant, the Abominant (more on him later). Dernicus has fielded these lumbering hulks before, now he’s back to see how they’ve changed. The Statline: What do they bring? First off, let’s look at their statline. As infantry, they have a standard 6″ movement. This means they aren’t as quick as Purestrain Genestealers, but they won’t lag behind any but the fastest units. They hit on 3+ in close combat, and 6+ in shooting (of which they have none). To that effect, they have a base strength of 5 which puts them ahead of Purestrains or Acolytes. They also sport a Toughness akin to Purestrains over Acolytes or Neophytes. Each has 2 attacks, which is respectable for their cost. Defensively they only have a 5+ armor and no invulnerable save, which can be a pain for their cost. Abilities: So what’s the big deal? Each aberrant comes with the abilities: Cult Ambush, Bestial Vigor, Unquestioning Loyalty. Starting with Unquestioning Loyalty, the aberrants can intercept wounds dealt to GSC Characters on a 4+. While it is a high cost (the Aberrant is removed), it can mean keeping your Warlord or buff character alive, nifty. They also can make use of Cult Ambush, the Genestealer Cult ability to deploy, on a random dice roll, just about anywhere on the board. Hopefully the codex will bring some good manipulation techniques, but we’ll see. Lastly, there is Bestial Vigor: damage is reduced by 1, to a minimum of 1. It also grants a 5+ “Feel No Pain” effect. We’ll touch on how useful this really is in a moment. Weapons: What’s that in your hand? Everyone’s favorite topic: how do they kill stuff? Aberrants are exclusively close-combat oriented with a handful of weapons at their disposal, mostly hammers, mining picks, and actual road signs! With their moderate strength, and number of attacks, they can dish out some serious damage. For lighter targets, Picks also grant the ability to use the Rending Claw each has for every Pick attack. For harder targets, Hammers dish out flat damage 3, at the expense of -1 to Hit. Hypermorphs, the upgrade you can purchase per 5 models in a unit, can take Heavy Improvised Weapons (aka road signs). When using one, they can double the number of attacks rolled, though also at a -1 to Hit. Without buffs, the heavy weapons are hitting targets with Strength 10, and typically doing 2 or 3 damage, ouch! Don’t forget, everyone is equipped with a Rending Claw too, so they can all do a number on chaff units where the greater AP and damage is less useful. Dernicus prefers mixed units to get the most out of an expensive element. The automatic Rending Claws always give an option without penalty, while hammers and picks increase the raw damage when needed. Without buffs 4 Pick/Claw, 4 Power Hammers, and 2 Improvised Weapons, Aberrants put out a solid 14.74 average wounds against a T8 3+ target. That’s a Leman Russ in one go or more importantly a degraded Knight! Alternatively as a horde clearer they can do the job putting out 14.76 wounds against Guardsmen equivalents and other chaff units. What really gets them going is the math after being buffed! Buffs: Yeah, but how do you make them better? Being an Index army, Genestealer cult has a limited amount of synergies. They do have some buffs, and gained some more with the Abominant. Basically every character in the faction can bring a benefit, save the Patriarch (though he’s busy being the Father of Us All of course). A Primus can help offset the -1 to Hit of their heavier weapons, while making their Picks and Rending Claws hit on 2+. A Magus can cast Might from Beyond to give them more attacks and strength, or use Mass Hypnosis to prevent enemy Overwatch which is a huge help. An Iconward can boost their strength in case Strength 5 or 10 wasn’t enough. And finally an Abominant gives nearby Aberrant units “exploding 6s”, where unmodified 6’s count as 2 hits instead of 1. Now, GW was clever in the wording of “unmodified 6”, learning from creative uses as we’ve talked about before. In the best case scenario with the mixed use squad of 4 Pick/Claws, 4 Power Hammers, and 2 Improvised Weapons on your Aberrants damage increases significantly. Especially with the Might from Beyond for that extra attack (and strength) from the Magus. Against T8 3+ targets they now do 27.94 wounds on average. That’s a Castellan on turn 1 with lucky rolls/positioning. Do things have to go right? YES. Is it one of the better threats to force your opponent to turtle with his chaff instead of killing your squishy Genestealers? YES. If you’re super lucky you could take control of the big shooty Knight before assaulting it with the Magus’s other powers. Oh speaking of chaff… Aberrants do an average of 32.22 wounds against guardsmen equivalents! The extra attack and push to strength 6 really help out. Charge all the units and pray you shutdown overwatch. And by our powers combined! Each of the above character buffs are great, especially with how Cult Ambush works with characters. You can ensure at least one buff is in range. The best case scenario is having 2 or more of them nearby, turning the Aberrant unit into an unstoppable killing machine! Dernicus, in a recent event, routinely put a large 10 man unit near an Abominant and a Primus to great effect. Be it Knight Gallants, big units of Beasts of Nurgle, or Necron Destroyers, nothing survived! While they don’t have the volume of a Purestrain squad, they make up for it in quality hits and wielding multiple damage weapons. Two by Two, or Party Together? Dernicus is an avid proponent of large, diverse squads as they gain maximum benefit from the buffs and spells available. Furthermore, let’s look at their defensive abilities. With a larger squad, the ability to reduce the damage of incoming fire effectively doubles the usefulness of their FnP rolls. In 8th edition, the prevalence of multiple damage weapons would normally make their 2 wounds nearly useless, but when an Autocannon only does 1 damage a 5+ FnP goes a lot further. Even so, with only a 5+ armor, AP -2 or greater becomes more dangerous and even more so if those attacks only deal 1 damage. Larger squads mean casualties will have less of an impact on the unit’s damage output. Smaller squads that are reduced to 1 or 2 models have less of a chance of surviving Overwatch, or dealing enough damage to targets engaged. Knowing what they can do and how other elements synergize, how do you best use them? First and foremost, we highly recommend utilizing Cult Ambush to deliver them. A power level of 7-14 means a significant investment in your reserves. Also, with a 6″ movement they aren’t likely flying across the board. Ideally you should use the Primus’s Meticulous Planner to reroll the Cult Ambush result means both one of the buffs and the unit itself are put into position. If the enemy presents an ideal target, such as a Magnus, an infiltrated unit of Sydonian Dragoons, or a Leman Russ without a proper screen, you can Ambush up to 3″ away. Using Mass Hypnosis to prevent Overwatch or using terrain to block line of sight is key. As with any other assault element, proper use of terrain, or trapping units by surrounding them makes all the difference with Aberrants. Another use, albeit an expensive one, is to use the Aberrants as a flanking unit rather than going down the middle. With Rending Claws on every model, and additional attacks from the road signs and or Power Pick’s can make quick work of light infantry. If the enemy moves away, you can use the Chapter Approved Stratagem Return to the Shadows to Cult Ambush elsewhere. 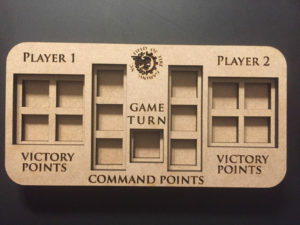 This is great for a turn one screen clear and a turn 3 follow-up punch after the enemy has repositioned or deepstruck their own heavy hitters. They aren’t the cheapest unit, Purestrains are nearly half the cost, nor are they the most numerous capping at 10 models vs 20 for every other one, but, they hit the hardest, can take return fire like no other, and just look cool to boot. With some minor support, their simple profiles become explosive. Purestrains might leverage speed and volume of attacks, they can still die to a lasgun the same as a lascannon. The same number of Aberrants would take 2 or 3 times the number of lasgun shots to bring down. Likewise they have potentially a better chance of surviving a Lascannon thanks to Besital Vigor. While Aberrants aren’t the only aspect of a Genestealer Cult Uprising, they fill a much needed heavy punch element. Once the Codex drops, there will most likely be more ways to power up these beastly mutants. Dernicus brought a unit of pure Index Aberrants to the first Barnyard Brawl where they killed their share. In one game they dusted Mephiston, another they were less useful. More recently he used them in a local event with their updated rules. The increased damage output and the new Abominant’s buff made their effectiveness significantly better. Look out for more reports on the carnage they’ll inevitably cause. We can’t wait for the Codex and will for sure be following up with any changes. Did we get something wrong? Have any strong opinions? Let us know on our Facebook page, through email at support@fieldoffiregaming.com, or commenting below!